In the last three weeks I’ve cycled 830km across 1273 hills, hiked up 8 Munros and 4 Corbetts, and scratched 253,953 midge bites 37 times per day. I camped for 20 consecutive nights and have lost count of the number of ways it’s possible to lose a pair of socks and find them again in an unlikely location. I’ve woken up in more pools of water than a thirsty frog, and drunk in more bars than Oliver Reed. I can now get it erect in less than 5 minutes (my tent). I would be lying if I told you that I wasn’t pretty tired at the end of it all and in need of a rest. I’m not a natural athlete and don’t enjoy training much, but 3 weeks of cycling and hill walking in north-west Scotland has been a good substitute. Next month Edita and I hope to ascend Chimborazo, the highest mountain in Ecuador, by cycling from sea level to 4500m, then climbing to its summit. Simple for some people, perhaps, but neither of us cycle much. To prepare for it we decided to bike the North Coast 500, otherwise known as the NC500, a 516-mile cycle route around the coast of northern Scotland. As I reported in my dispatch last week, that went well. We completed the route in 13 days, and I only collapsed twice. 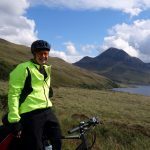 “Happy memories – this time last year we spent a wonderful week cycling round the NC500,” my friend Lloyd posted on Facebook when we were about halfway round. “A week? We’ve been at it a week already, and we’re only as far as Durness,” I replied. It took Lloyd just 6 days. 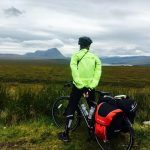 He also cycled from Bettyhill in the far north to Helmsdale on the east coast in one marathon 100-mile day. It took us 2½ days to complete this section, during which I slept by the side of the road to get my breath back, and we took shelter in a craft shop to escape a particularly heavy deluge that I nicknamed Hurricane Pisspot. I was looking forward to getting off the bike and hiking up some hills. I had promised Edita that the mountains of Scotland are just as beautiful as the Apennines. Our original intention had been to hike one or two during our cycle ride, but a combination of aching buttocks, tired legs and our speed of progress quashed that idea fairly early on. Instead we decided to spend a week afterwards, climbing some of the peaks we had seen from the road. This limited our options somewhat, as many of the best peaks had been in cloud when we pedalled past. I forgot to tell Edita about the peat bogs. This is a section of the trail on Quinag. I hadn’t told Edita about the weather, but she’d worked it out by then. During our cycle ride it had rained almost every day, but we’d also enjoyed short periods of sunshine and clear sky. The weather changed from hour to hour, sometimes from minute to minute. In Scotland you’ve just got to enjoy the good moments and accept the rough patches in between. There’s rarely such a thing as a perfect weather forecast. If you wait for one of them then you’ll never climb anything. Instead, there are fair weather forecasts where you take your chances. We decided to base ourselves in Ullapool initially, and pick off some of the peaks around there. Ullapool is the largest community on the north-west coast, with a population of 1500. It has a lovely setting on the shores of Loch Broom, a sea loch surrounded by mountains. There are several pubs and restaurants, a ferry terminal, a campsite, and tour companies offering boat trips around the islands. Our first big day involved climbing Quinag, an isolated Y-shaped peak rising above peat bogs north of Ullapool. We cycled around two sides of it on the seventh day of our bike ride. It has three peaks which are classified as Corbetts (a defined list of 222 peaks in Scotland that are between 2500 and 3000 feet in height). We climbed the first two in thick cloud, with visibility down to only a few metres. I expected it to be one of those days with no views, when every peak bagged is a tick in the box. But as we sat on the summit of Sail Gharbh, the third and highest of the peaks, at 5pm in the evening, the sun suddenly penetrated through and burned away the majority of the cloud, revealing a lovely panorama to the south, of isolated peaks, lakes, moorland and the Assynt coastline. It made the whole climb worth it. 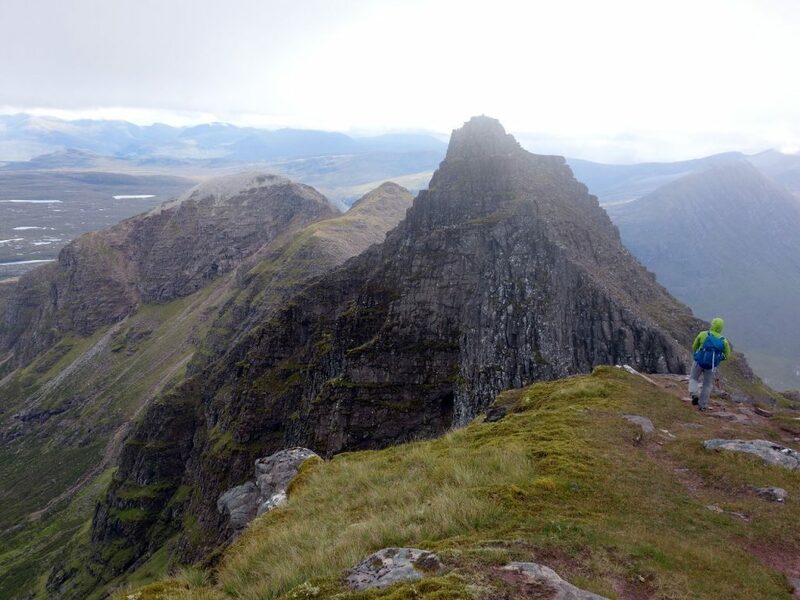 The next day we climbed An Teallach, a complex mountain of rocky pinnacles and rounded ridgetop peaks, surrounding two huge corries. 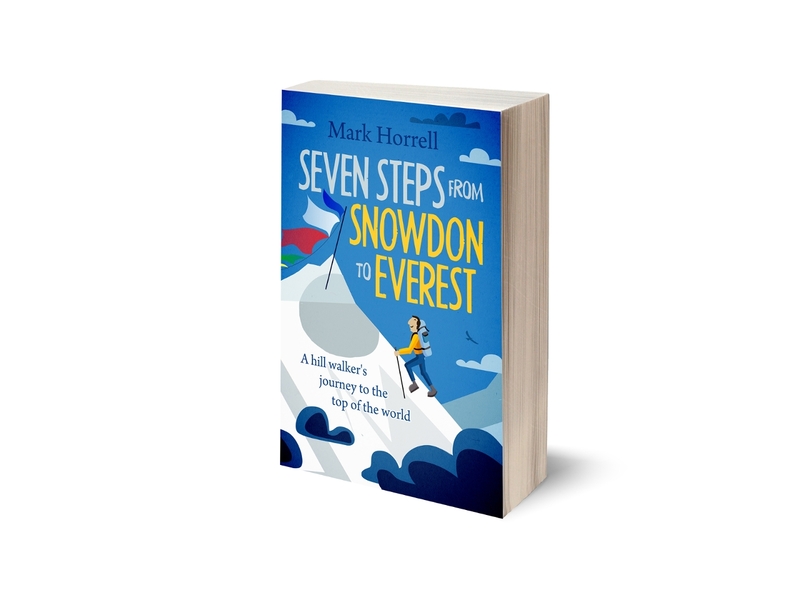 It’s one of those peaks, like Snowdon, that has many interesting routes up, and you could happily climb it again and again. Some people regard it as Scotland’s finest mountain, but its isolation means that not many people go there. 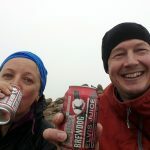 It was a great peak for Edita to climb as her first Munro (a defined list of 282 peaks in Scotland that are over 3000 feet in height), but the weather was a little cloudy. On the plus side, the mountain has a beer named after it. On our third big day we bagged four Munros in a range of peaks known as the Fannichs. We had seen these from a high plateau on the day we cycled to Ullapool. 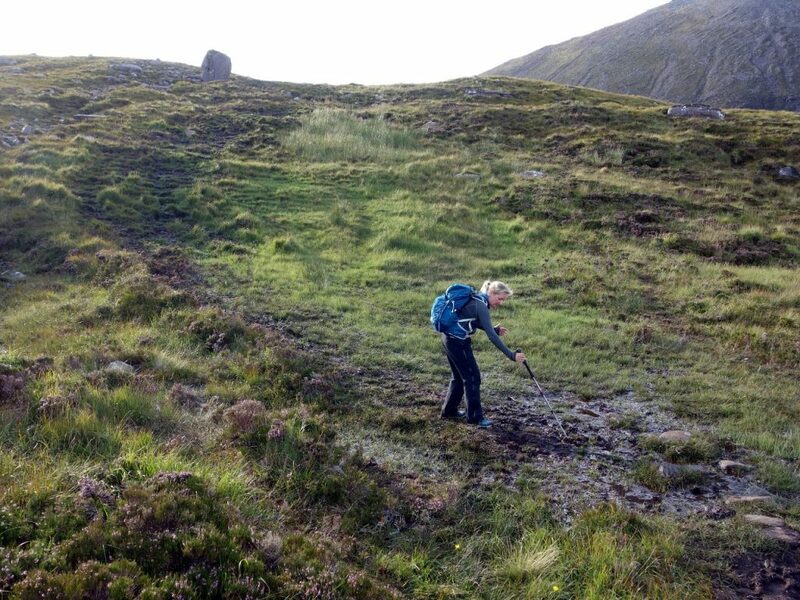 The trails to these peaks are badly maintained and disappear into the peat bog in various places. It was an interesting experience after the well-maintained trails we’ve been ascending in the Apennines, and quite tiring. The weather was poor that day. It rained heavily, and for the last four hours we found ourselves in thick mist. The trail down from the last peak was very muddy and a haven for midges. The joys of Munro bagging. You need a sense of humour to go up hills in Scotland, and a good memory for unpronounceable mountain names. 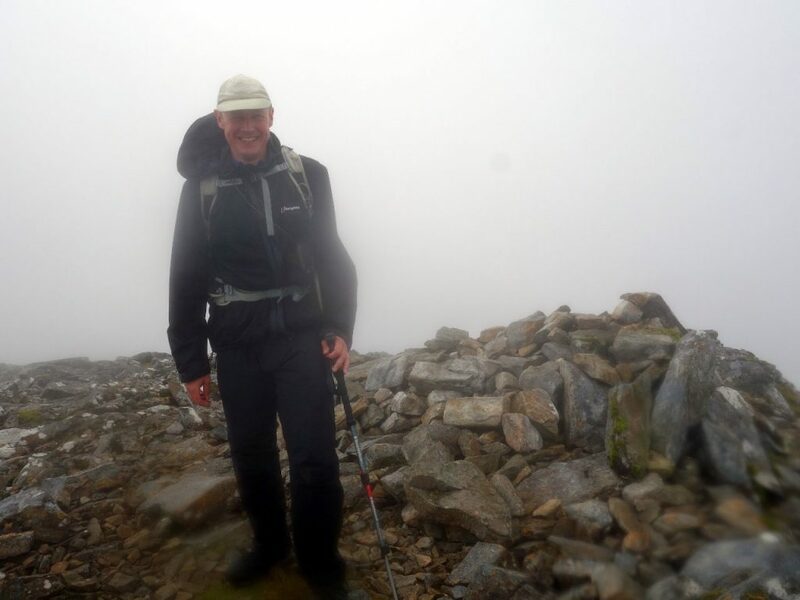 Here’s my summit photo on top of Beinn Liath Mhor Fannaich. At that point the weather became really bad. The porch of our tent at the campsite in Ullapool was becoming a mud bath, so we moved to Lochcarron, another village on the shores of a loch a few hours to the south. This had seemed like a nice place when we cycled through it on the second day of our bike ride. The owner of the campsite in Lochcarron apologised for the state of the ground. He explained that there had only been four dry days in July, and although the figures weren’t out for August yet, so far there had been only two or three. We didn’t see much of Lochcarron this time. For most of the two days we spent there it was hidden in a shroud of grey mist. 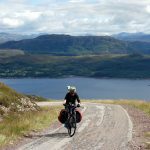 We reacquainted ourselves with the Bealach na Ba, the highest pass on the North Coast 500 cycle route, and regarded as the hardest cycle ride in Britain. The weather was awful – a sheet of thick mist, treacherous to drive through, let alone cycle up. Nevertheless, we parked at the top and climbed another Corbett, Sgurr a’ Chaorachain, which is accessible along a ridge that we could only imagine we were walking along. The next day the weather was even worse. Not only was Lochcarron shrouded in mist, but the sky was a flushing toilet of heavy rain. We accepted an invitation from my brother to visit him in the Cairngorms, a mountain range in eastern Scotland. I was right on one count. It didn’t rain. We climbed two more Munros, Beinn Bhreac and Beinn a’Chaorainn, two rolling moorland peaks linked by – you guessed it – a large 4km peat bog. It was windy on top, which made for a cold afternoon, but the sky was clear and there were no midges. The trail disappeared into the bog halfway across the plateau which linked the two peaks. It was a long, slow, 4km, involving wet feet and island hopping. But we bagged the two Munros, scrambled back down into Glen Lui and speed walked back to the car park at Linn of Dee, chased by midges. Edita’s Munro tally is now eight. Mine is 94. We still have a little way to go, and I don’t think she’s super excited about doing the rest of them yet. But, surprisingly, she did like haggis, and it was a relief to get off the bike and back on my feet. I love hiking in Scotland. Ecuador, Chimborazo, sea to summit? Bring it on. Sounds like fun. At least it yields a great read!